A combination of ABC Reading eggs, bedtime stories and Lottie’s wonderful preschool have been bringing her literacy skills along great. But things went turbo charged on the letter recognition and pre-reading skills when I picked up this thing for $8 at Kmart a few weeks ago. 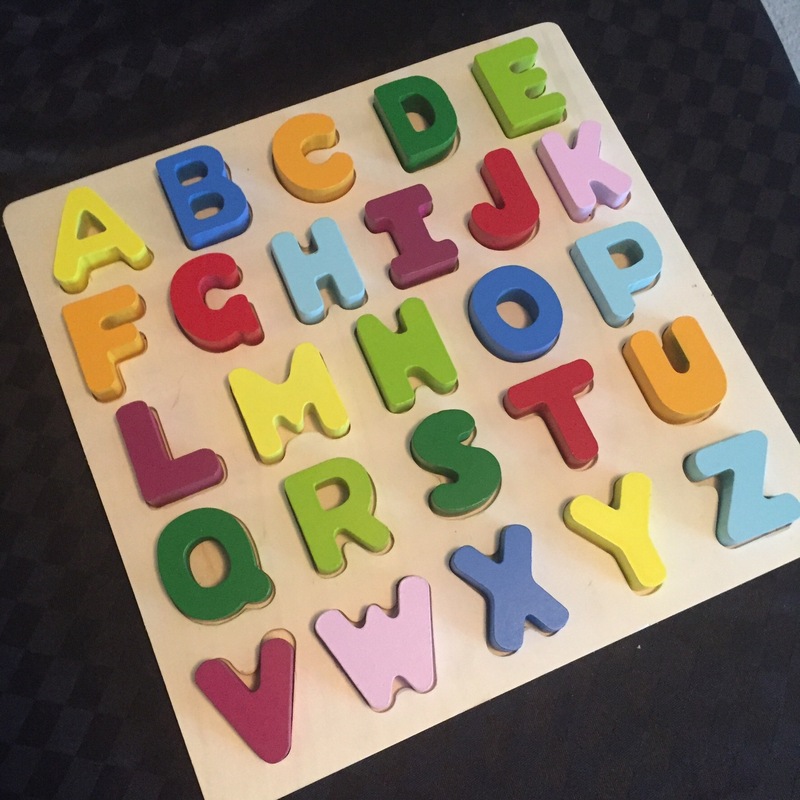 It’s just a simple wooden puzzle board with the letters of the alphabet but the effect on Lottie’s literacy has been instant and massive. She’ll sit at the table and pick up each letter listing the words she knows that start with that letter – the friends names she learned at preschool and basic words from our books at home, arrange them to match small words like “Pig the Pug” and hand out the letters to visitors who’s names start with them. Auntie Kate gets a K, Daddy gets a D or an O for Oli. We’ve come up with a few little literacy games, perfect for the evening while dinner is cooking or weekend afternoons. This is my favourite. All you need is one of your child’s favourite books. Boards books with few words and large print work best. We’ve been using a Peppa Pig one. Just choose a page, ask your child what is happening in the story and then to pick a word on the page. They then choose the letters from their puzzle and lay them beside the word, sounding out the letters as they go. This works best with two children but another adult can play along too. Pop all the letters from the puzzle in a bag, give each player a basket and then pull a letter from from the bag. Put 1 minute on the timer and race to find as many objects that start with that letter as possible. A calmer option would be to walk together around the house with the chosen letter pointing out all the things that start with that letter. Always a solid choice, another game for 2 children or you and your child. Keeping the puzzle pieces in the bag, have a piece of paper with the alphabet written on it or the child’s name and some markers to place on the letters as they are drawn.